NAATI stands for National Accreditation Authority for Translators and Interpreters. Having NAATI Accreditation gives individuals the ability to present themselves in helping people from various linguistic backgrounds other than English. There are different ways of being accredited by NAATI and one of them is by sitting for a NAATI test. 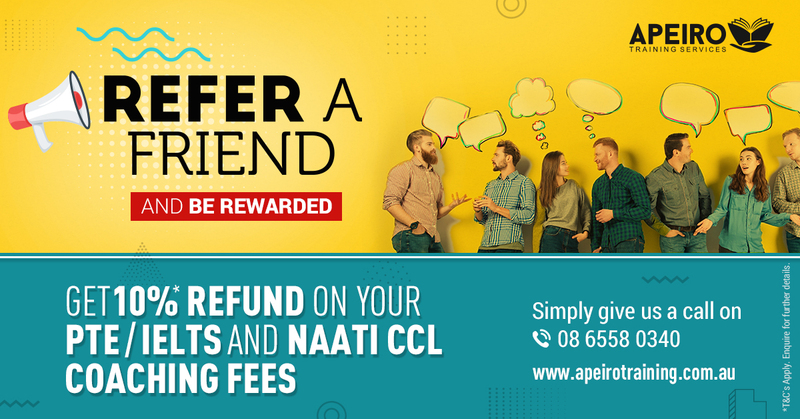 At APEIRO Training Services, we provide coaching for those individuals who are willing to sit for the NAATI CCL test. We can help you in gaining 5 CCL Points for Migration purposes. With the knowledge of experienced Professional Translators and Interpreters, we give you in depth knowledge on how to approach the test to achieve fulfilling results. Speak to us today to get more information on how you can achieve your CCL Points. Disclaimer - APEIRO Training Services is not affiliated to NAATI nor represents NAATI.